A short one, because I’ve been commenting on other people’s blogs a lot recently (Scholarly Kitchen, Open and Shut, The Scientist) and it infuriates me how hard it is get a good back-and-forth discussion going in those venues. The contrast of course is with SV-POW! itself, where we’ve often had excellent, busy, informative comment-threads (example 1, example 2, example 3) that have resulted in us learning a lot from our commenters. So why is it that some blogs’ comment streams are lively and productive, whereas others are relatively sterile? 1. Turn on comments. It should be no-brainer, I know, but it always brings me up short when I find a blog post with commenting disabled. When a blog keeps doing it, it’s one of the most likely factors that will make me give up on the blog altogether. If it’s just one person preaching, it’s much less interesting than a discussion. 2. Do not require registration. This one, too, should be too obvious to need stating. Notoriously, the Scientific American blogs require you to register before you can comment, hence the fact that the SciAm incarnation of Tetrapod Zoology gets less than half as many comments as the old Science Blogs version used to get. And that in turn is why even now, eight months after Darren stopped posting at the old site, it’s still Google’s top hit for “tetrapod zoology”. Science Blogs lets you comment just by filling in your details on the comment form, and of course browsers do that for you, so the process is painless. “But registration is fast and free”, say the SciAm people. Doesn’t matter: it’s a road-bump. At any given moment, the point someone wants to make in a comment is probably not enough to push them over that bump. So don’t make them do it. They just won’t. What the heck does that say? Is that “ri” or “n”? Is that a “t” or and “f” just before that other thing that might be “1” or “l”? And why are you putting me through this when I am trying to contribute to your blog? Again: people will just shrug and walk away. Bloggers who use blogger.com tell me that they have no choice about this, that the platform imposes it. If that’s really true, then ditch blogger.com. It’s just broken. 4. Do not moderate comments. This is the potentially controversial one, because up till this point I don’t think I’ve said anything that anyone reasonable would disagree with. But this one is counter-intuitive. When you start a blog, the natural thing is to want to feel that you’re in control of it, and that means controlling what can be posted there. But that’s a mistake. Moderation means that people can’t see their own comments, which is alienating; but more importantly, it means other people can’t see them, which in turn means that all discussion grinds to a halt until such time as you happen to moderate. So. You don’t need to moderate to filter spam, and you don’t want to moderate to control discussion. Just open it up. 5. Allow subscription to followups. Some platforms let commenters tick a box or click a link to ask that they be emailed when someone posts a followup comment. That’s a very valuable feature, because it makes people aware of how the conversation they’ve joined is progressing, and gives them a chance to respond. 6. Reply. A very obvious one: engage with the comments yourself. You want to be a part of the conversation, as well as having the privileged position of setting the agenda. 7. Oh, and write something interesting. Your posts catalyse the comments. Once a comment stream is up and running, it has its own momentum, but it will only get started if you give it a push. Now I am not suggesting that you deliberately set out to write controversial articles, or really that you set out to write anything other than what interests you. There is really no point in writing about anything that doesn’t interest you — if you’re not enjoying your blog, then no-one else will, either. Now that I come to review, I almost wish I’d said less — because one of these seven points is the burden of my message, and that one may have got a bit lost in the middle. It will come as no surprise to anyone that if you want fruitful discussions in your blog’s comments, you need to turn on comments, avoid speed-bumps like registration and CAPCHA, let people subscribe to followup comments, reply, and write interesting articles. The only remotely controversial part is do not moderate comments, and that’s the main point I want to make. So here it is again: do not moderate comments. You heve enterely onvinced me of stop moderating comments. I just had not noticed the spam is now controlled in blogger. I just had not noticed the spam is now controlled in blogger. Possibly because it is so poorly controlled. I am an author on one Blogger blog–at which I have not posted in years now–and at least four WordPress blogs. Guess which one has a problem with spam making it through, requiring me to periodically log in and flag spam as spam? If you guessed Blogger, you get the cookie. And this absolutely blows my mind, because the spam detection in Gmail is so good, and yet Gmail and Blogger are both Google products. How can one be so good and the other so lousy? As for the post: I echo everything Mike says. Especially about the horrendous brain-damage that is capcha, and the absolutely perverse stupidity of the SciAm blog setup, which lacks tons of useful features found on free blogs like WordPress and even, yes, Blogger. It’s like they set out to make a blogging platform that would have been substandard in 2006. I can say that because I was blogging in 2006. Darren, whatever they’re paying you, it’s not enough. You’re a young man with propects. Fly to another land! Be free! I’m sure I don’t need to say it, but… when I saw the chance/was encouraged to join SciAm, I was led to believe that commenting would be totally open – viz, as it is at ScienceBlogs, perhaps even less restrictive. It was thus a real shock to find things made so maddeningly awkward. I (and others) have done everything possible behind the scenes to change this. Without leaving SciAm, all I can do is hope that the many promises come through. I’m not about to leave SciAm – now that I’m part of the hidebound, ivory-tower academic system, brownie points are attached (and, no, the financial rewards are not, well, rewarding). Having said all that… if you’ve been watching Tet Zoo lately, you’ll know that many articles now pull in over 30 comments. This is higher than the approximate average at Tet Zoo ver 2 (c. 23) and represents a strong commenter community and a lot of work on my part. Compare it to the rest of SciAm, where most bloggers don’t seem to get any comments, ever. My main advice to encourage comments: interact!! I’ve seen some astonishing cases where an author writes a provocative article and then simply fails to make an appearance when 10s of commenters then voice interest, disagreements or challenges. One thing not mentioned here – whackaloons are great if you’re interested in traffic. That’s why I held off banning those two or three special individuals for so long. PS – one vital piece of advice to anyone who spends more than 5 seconds writing a comment on a blog. COPY IT before you submit. I always do this, since there are many, many, many occasions where retarded publishing platforms, or internet problems, have resulted in the destruction, deletion or loss of my comment some time during or after the process of clicking ‘post comment’ (it happened to this very comment!!). WordPress allows you to moderate all first-time commenters, but not ones who’ve already had a comment approved. This, to me, is the best possible solution. For a start, it allows for the free-flow discussions that you rightly praise among the established commentariat. It also allows me a lot of control over trolls and spambots (for some reason, my spam filter is piss-poor to the extent that I was getting some 20 or so spam comments a day). 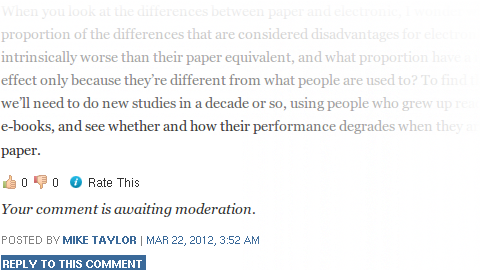 Moderation is now not a case of actively pruning a discussion. It’s more like running auditions for people who can partake in that discussion. On the other hand, WordPress this week came up with the brilliant idea of forcing anyone who had a blog on their account to log in after they hit “comment,” and then nuking the comment. I emailed them on it, and their solution is to input another email. In other words, lie about who you are. Fine, I’m happy to escape their attempt to track me. Somehow, being high-handed and then encouraging your customers to lie to you doesn’t strike me as a good business strategy, but then again, I’m not in business, so what do I know? Finally, this is great advice if you have a service hosting your blog. If you run your own blog, spam can be a serious problem. See http://www.antipope.org/charlie/blog-static/2012/03/spam-awareness-102.html for an example from last Friday. Which version of CAPCHA you have installed Mike? The one on my site is actually very simple and friendly. It’s just a simple math problem using a combination of numbers and text. And you just fill in the blank. It’s easy to read, easy to solve, and prevents spambots from flooding your comments. Darren’s hit the nail on the head – if you want to have good conversations in your comments, even ones that run off at a tangent, the blogger needs to pop back in and respond at least every now and then. I know that of course you (Mike, Matt, Darren) know this but I think it’s worth shouting: BLOGGERS, IF YOU WANT GOOD CONVERSATIONS, JOIN IN AND ENGAGE YOUR COMMENTERS. Like Mike, I have drifted away from some fairly interesting blogs because of a lack of participation by the blogger post-blog (and I haven’t time to read them all anyway). I have yet to be given sufficient impetus to put myself thru the pain of reg’g at SciAm (sorry, Darren) but half (ok, only a third) of the enjoyment of TetZoo is reading the generally informative comments along with Darren’s frequent responses. Except for the nutters; the first couple of their comments are often amusing but they grow wearisome very quickly. Because I’m always (understandably) trying to get people to register with the SciAm commenting system, let me note that the system is a bit quicker than you might think. You register by providing a username and password, but you _don’t_ (despite what it tells you) need to wait for a confirmation email – you are in fact good to go. And, yes, I know I know I know that this is all too much trouble for 99.9% of potential commenters (it certainly is for me, were I to see it on another blog), but I have to mention it. Zhen, I don’t have any version of CAPCHA installed — it’s just not necessary. But that doesn’t help me, because whenever I comment on anyone’s Blogger-based blog, I have to use their dumb CAPCHA. As for your arithmetic CAPCHA: no. It’s less painful than some others, but — and I really can’t say this clearly enough — you don’t want to put any obstacles in your commenters’ way. Because the message any CAPCHA sends is “we don’t really want you here, but as a special favour you can post something just this once, if you must”. But you want to make a community. You register by providing a username and password, but you _don’t_ (despite what it tells you) need to wait for a confirmation email – you are in fact good to go. How long has it been like this now? A year? I know I’m preaching to the choir here, but this is beyond pathetic. The message from SciAm (despite the involvement of Bora and of top-notch bloggers such as Darren) is “we don’t care about this stuff”. Moronic to be sending that message. Yes, whoever is in charge at SciAm >>doesn’t get the whole blogging thing<<. I'm kinda tired of hearing this and saying it myself. Mike, sorry, total brainfart there. Yeah, you don’t have it installed. That said, how do you keep spam from appearing from your comments though? My site, despite not being well know at all, get spam regularly. That’s why I installed it. how do you keep spam from appearing from your comments though? My site, despite not being well know at all, get spam regularly. That’s why I installed it. WordPress has a plugin called Akismet that identifies spam and filters it off into its own folder. (Every now and then I check that folder for very rare false positives.) It’s turned on by default for a wordpress.com-hosted blogs. By my count, the first five of the seven points in the post are covered by “use WordPress and its default settings”. I like to think my blog’s topics (Waxing Paleontological) are interesting but they almost never generate comments at all, which is maddening. Is Blogger part of the cause? It could well be a contributory factor. But even after doing this for more than a decade, Matt and I have virtually no idea what posts will and will not catalyse a discussion. The whole process is maddeningly random.